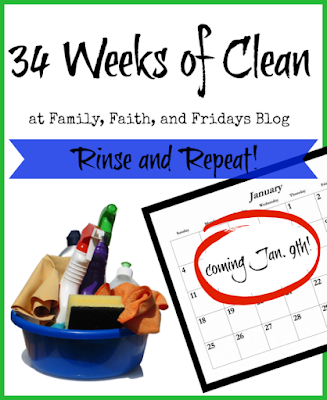 Family, Faith, and Fridays: 34 Weeks of Clean Returns! I'm joining you this year! Let's get this cleaning party started!! Excited to have you join us this year Nicole! Absolutely need to do this with you again! SO THRILLED you are back with us! You ROCKED last time, Suanna! As a military brat and then wife, I never got into the spring cleaning, purge habit. You deep clean when you move out and in! Now stationary for more than a year at a time, I need to get into this! I could've written the same thing. Glad to have fellow military with us! So need this! Joining in in 2017!!!!! I'm ready to get started again. I need another round of purging and my house needs another round of cleaning. Fun! Where do we find the book? The book is being written so I hope you will be able to buy it by 2018! Until then, you can follow the plan here on the blog. We will post a new assignment each Monday! I was pregnant/had a newborn the first time, so I never did get very far. We've moved since then, and although I was ruthless with the move, I can slowly see the clutter starting to sneak back in. I'm in! SO glad you are going to join us! Amazing how quickly it builds up, huh?! Count me in!!!! I need this SO BADLY!!! I'm in! We have way too much "stuff". Back on active duty days, it was much easier because we more moving every two years. We had to get rid of stuff. Now that hubby is retired, we've been in the same house for 9 years. The amount of stuff accumulated in that time is ridiculous! Glad you are joining us! I hear ya- the military moves have kept us pretty streamline! Oh yay!!! I missed seeing this last week, but I am IN for another round! YAY!! Glad you are back with us!! !